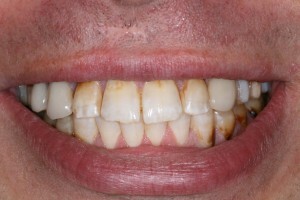 These are examples of recent treatments and ‘before and after’ photographs. 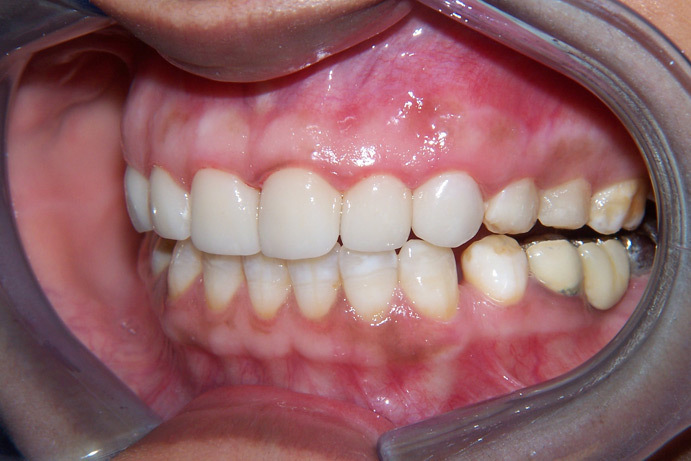 This lady came in to discuss tooth whitening, but wasn’t a suitable candidate as the discolouration was a result of a developmental abnormality and would be unaffected by the whitening process. We discussed the treatment options and felt that minimal preparation veneers would be the best option. This allowed for a very conservative approach and I did very little adjustment to the teeth. Two weeks later we fitted 6 veneers, a simple case but the effect was truly amazing and we were all smiling. Debbie absolutely hated her teeth and would always cover her mouth when she smiled. To make matters worse Debbie wasn’t very keen on seeing dentists, avoiding treatment wherever possible. Debbie’s main complaint was the uneven appearance of her front teeth and the uneven spaces. She didn’t like the teeth that stuck out at different angles from the rest. As always the first stage in planning the proposed treatment was to make some stone models of the teeth and then set up the new smile in wax. Debbie was so excited with what her new smile was going to look like, she wept the odd tear of sheer joy and we even took pictures of the models. Debbie’s new smile has really changed her life – she now invites her friends round just to talk about her teeth. 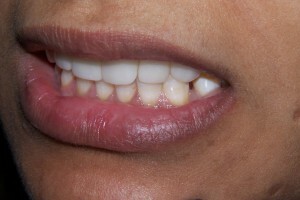 Harpal had become slightly obsessive about his teeth and the gap between his front teeth in particular. He had 2 attempts at orthodontics (moving teeth with braces) but the gap had gradually reappeared. The last attempted at orthodontics had left marks on the teeth and moved the upper too far inwards, causing excessive tooth wear. As always we completed the diagnostic wax up, which we used to create a template that would allow us to prepare the teeth in order to get the exact result we both wanted. Harpal is a changed man; he his is still obsessed about his teeth, but now he is telling everyone about his new smile. Luke had planned the perfect wedding in Cyprus; his only worry was the appearance of his smile. He didn’t want to smile, but he also didn’t want to ruin the big day. Luke had been through a number of attempts to improve his smile, but veneers kept falling off. His main complaint was the stained appearance of his front teeth, both upper and lower. He had nice even teeth, but they were discoloured and the continual problems with failed veneers suggested Luke also had a problem with his bite. 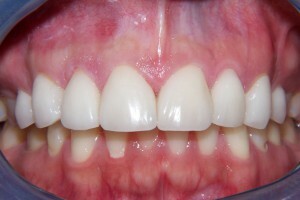 We completed the diagnostic wax up, tooth whitening and adjusted the bite, prior to preparing the teeth and fitting the veneers. It took a quite a bit of adjustment to get the bite right and Luke has a splint to protect his teeth when he grinds his teeth at night. Luke brought in his wedding pictures and they looked great, with his beaming smile he nearly, but not quite, stole the show from his beautiful bride Sarah. In the past she had braces (Orthodontics), to straighten her smile and to close a gap (diastema) between her front teeth. Since then the gap had reopened – this is called a relapse. Milly was not interested in having further orthodontics to correct the gap again, so we agreed to use a tooth coloured filling material to make her teeth wider and so close the gap. I used composite bonding techniques, and within an hour her smile was transformed, closing the gap that had bothered her for years. Both Milly and I are delighted with the result. This is the kind of work I love to do – simple, effective, without removing enamel or damaging the underlying tooth in any way.